As per the latest statistics released by Water Supply and Sanitation Collaborative Council, Geneva on Menstrual Hygiene Day, 2018, approximately 50% of women in South Asia receive no information about periods prior to the onset of menstruation. A recent publication by Swachh India, NDTV revealed that 71% adolescent girls in India alone remain unaware of menstruation till menarche. 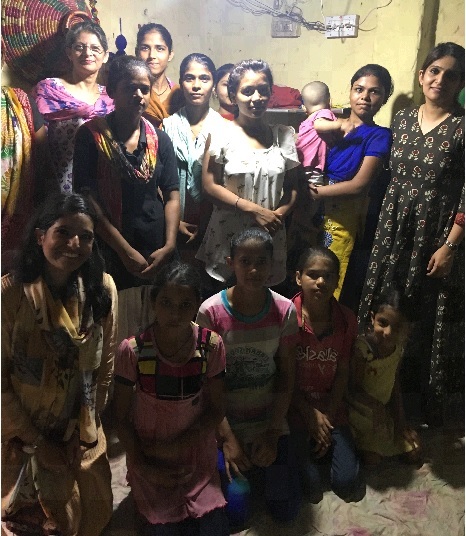 This year, on 26th June, The Pink Foundation team in Chandigarh decided to break this very silence around menstrual hygiene and nutrition which is much prevalent amidst women and men by organising a workshop on the subject for the women beneficiaries of our Majri Centre. Around 20 young girls and women belonging to Majri slums enthusiastically participated in the workshop. 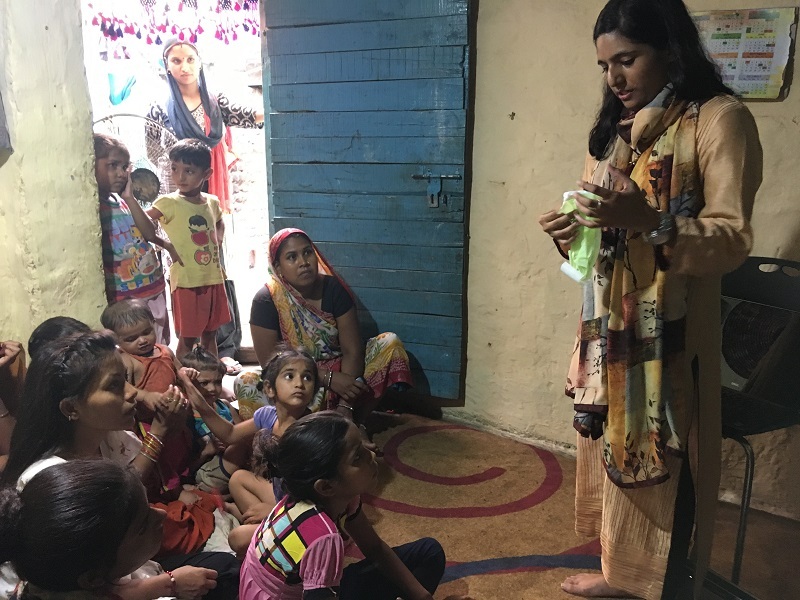 The workshop was conducted by Ms. Sabah Singh, a Counselling Psychologist with in-depth knowledge and expertise, having also organised a series of psycho-education sessions on various topics including menstrual hygiene, alongwith Ms. Kalyani Singh and Rubina N. Singh, our two other experts on the subject of nutrition and menstrual hygiene. The workshop primarily focussed on building a rapport with Women by discussing nutrition at the outset and facilitating other interactive activities so as to encourage them to share their knowledge and experience with the speakers. The speakers also used a creative graphic presentation to demonstrate fundamental understanding of periods and hygiene. The presentation, which used graphics and diagrams, made it easier for Women to comprehend the fundamentals involved with more clarity. It was highly satisfying to see some women ultimately open up about distinctive experiences and personal issues which they face during menstruation, therefore allowing the speakers to offer further advice and guidance. The expert speakers also encouraged Women to 'Break the Silence', be more inclusive in their outlook, to come forward and share their conditions and experiences with other women and even male members of their family, which is essentially quintessential for mitigating the social taboo around menstruation. 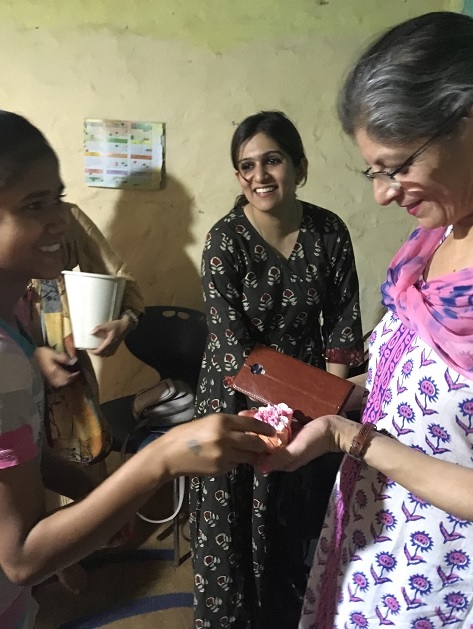 Lakshmi and Manjeet from the Majri centre presented a token of appreciation (handmade soaps and crochet bookmarks) to all the expert speakers, towards the end. This was a first at the Majri centre and we hope to continue conducting more of such counselling and interactive sessions / engagements with our women to enhance their outlook on diverse social issues.